Two myths, or, at least, oversimplifications, have long surrounded Edmund Burke’s iconic conservative identity. One, typically an unspoken assumption, is that he was widely recognized as “the founder of Anglo-American conservatism” from his own day forward. The other, typically a smug response, is that the idea of Burke as the seminal conservative thinker was cooked up in the mid-twentieth century, mostly by conservative Americans like Russell Kirk. This Burke has sometimes been dismissed as “the Cold War Burke,” an opportunistic construction that clashes with historical British understandings of him. The fact is that this retort is even more false than the static view of Burke. The conservative celebration of Burke in the 1950s and 60s built upon, and was consistent with, longstanding views of him. In some ways Burke was always Burke, not just in himself but in many public assessments of him. But his primary reputation did shift over time from “Burke the Whig statesman” to “Burke the conservative thinker.” This change, however, did not occur in the mid-twentieth century but long before that. 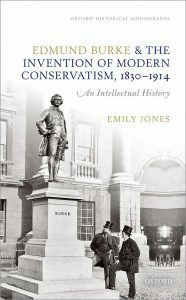 Emily Jones’s Edmund Burke and the Invention of Modern Conservatism is a work of intellectual history that chronicles the transformation of the dominant understanding of Burke, and with it the emergence of a firmer conception of conservatism, over the nineteenth century and the early years of the twentieth. The 1860s marked the beginning of a “Burke revival.” This began, Jones argues, as a result of the growing interest in history, and with it efforts to trace nineteenth-century political developments back to their eighteenth-century precursors. In the process of this revival, however, interest shifted away from the details of Burke’s politics and toward Burke as a political-philosophical thinker. This revival was marked by the publication of new editions of his works and by an “explosion of commentary.” Especially notable among the early commentators discussed by Jones is Fitzjames Stephen, to whom Burke scholars do not devote anywhere near the attention they give to his contemporary John Morley, but who does appear as an important conservative legal scholar in Russell Kirk’s The Conservative Mind. Stephen described Burke as a “founder of modern Liberal Conservatism,” an assessment that Jones identifies as “a first step in the long process which established Burke as a canonical ‘conservative’ political thinker.” Like some other nineteenth-century commentators, Stephen also called Burke a “utilitarian of the strongest kind,” but he decided a few years later that utility was for Burke subservient to a higher standard, that of a God-given order for humanity. “So Burke was presented as an empirically minded thinker, but not as a pure empiricist.” In the broad brush, this characterization of Burke is highly congruent with that by Kirk and other participants in the new Burke revival of a century later. By 1914 there was widespread agreement that the intellectual and political traditions of an organic historicist ‘C/conservatism’ had come into being in 1790 with the publication of Burke’s Reflections. In reality, however, both British Conservatism and conservatism, as significant bodies of thought, came into being in the years 1885 to 1914—and it was this which raised Burke into the canonical position he still enjoys as ‘the founder of modern conservatism’. Often, intellectual histories restrict their scope too much to scholarly discourses, ignoring the role of more popular opinion in shaping perspectives. To her credit, Jones treats both scholarly and political engagement with Burke’s legacy, some of which has been detailed above. Interestingly, Jones also chronicles the role played by the incorporation of Burke into British secondary education. In the late 1800s Burke came to be widely studied in British secondary schools, and student textbooks of his works were published. John Morley among others promoted youth study of Burke as an important form of political education. The author notes that Burke came to be read by both boys and girls, to be the subject of major examinations, and “to be placed alongside, if not equal to, Chaucer and Shakespeare in a short canon of English literature …” Both his American speeches and the Reflections were featured in British schools, though, increasingly, the Reflections became the primary focus of Burke study, and Burke’s outlook was widely characterized in textbooks as “conservative.” (The present writer can attest that the use of Burke in secondary education was not entirely limited to Britain and did not end in the early 1900s, having once encountered an elderly woman who promptly recited to him a passage from the Speech on Conciliation with America, memorized as part of an American high school curriculum in the 1930s.) The emergence of secondary school study of Burke coincided with explosions of both university study of him and private reading of inexpensive editions of his works. Thus by the early 1900s Burke’s position as the iconic representative of conservatism had been solidified. Emily Jones provides a great service by chronicling the emergence of Edmund Burke as we know him. The work downplays a bit the diversity of opinion on Burke throughout the period studied, but this diversity is not wholly ignored, and the aim of the book is to describe Burke’s emergence as the “father of conservatism,” not to provide a comprehensive account of past treatments of him. More significantly, many readers may wish that Jones displayed as much interest in the details of the specific content of the various “conservative” assessments and employments of Burke as she does in merely chronicling Burke’s growing reputation as the seminal conservative. What exactly were the understandings of Burke that emerged, and, especially, what exactly was the “modern conservatism” that emerged concomitantly with this revival of Burke in the latter part of the nineteenth century? Exactly how do these relate philosophically to later conceptions of conservatism and of Burke? The reader only gets a general and fragmentary sense of the answers to these questions. This book is, however, an historiographic work, not a political-philosophical one, so one cannot necessarily expect to find a great deal of political-philosophical exploration or analysis. Perhaps that is a book that still needs to be written. William F. Byrne is Associate Professor of Government and Politics at St. John’s University (NY) and author of Edmund Burke for Our Time: Moral Imagination, Meaning, and Politics.